The common tasks of the Accounts Payable Clerk are to perform accounting and clerical tasks pertaining to various accounts payable transactions of the company. 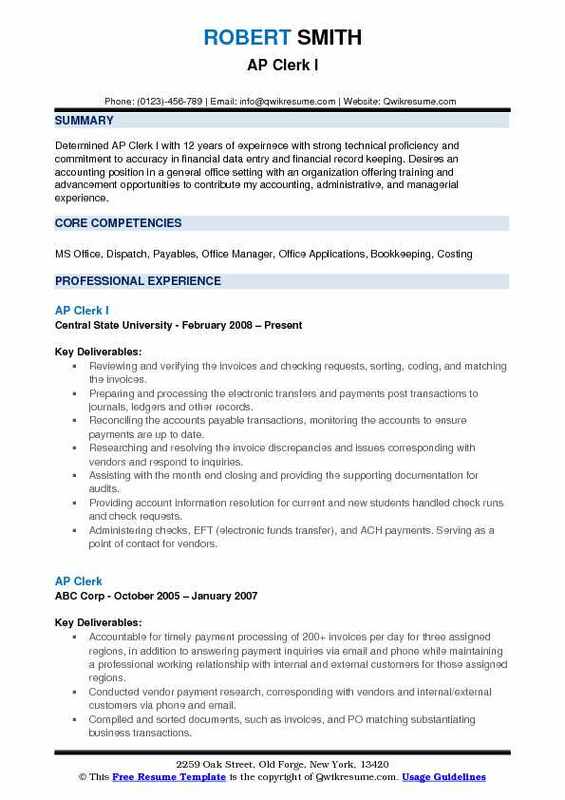 The other major tasks that are carried out on daily basis and listed on the AP Clerk Resume include – reviewing and verifying invoices, sorting and coding invoices; uploading invoice into database, preparing and performing check runs, posting transactions into journals, reconciling accounts payable transactions, preparing accounts analysis, monitoring accounts, maintaining vendor files, producing monthly reports, providing supporting documents during audits. The key competencies and abilities for the post of an Accounts Payable Clerk include – a very thorough knowledge of accounts payable, proficiency in GAAP, knowledge of relevant accounting software, proficiency in data entry and management and information management skills. As this is an entry-level position, a Bachelor’s degree in accounting or Finance will do the job, but advanced qualifications will be needed for career progress. Summary : Ambitious, well-organized Accounts Payable Clerk able to effectively prioritize workloads to meet rigid deadlines. Possessing a strong orientation to detail and good organizational skills, strong analytical skills, excellent communication skills (written and verbal), efficient, highly-motivated, and assertive with excellent accurate and thorough follow-through skills. Skills : MS Office, Word, PowerPoint, Excel, Outlook, Quickbooks, SAP, Epicor, And SAGE. Currently supporting the accounting department by processing invoices, purchase orders, expense reports, and resolving invoice and purchase order discrepancies. Processing credit card statements. Reviewing and researching vendor statements using Sage software. Responsible for supporting the accounting operations of the business by processing invoices, expense reports, making payments and resolving queries. Duties included handling telephone inquiries relating to accounts payable issues. Corresponding with vendors and respond to inquiries. Resolving billing discrepancies. Supporting the accounting operations of the business by processing invoices, purchase orders, expense reports, making payments and resolving queries. Processing credit card statements and check runs. Reviewing and research vendor statements. Responsible for supporting the accounting operations of the business by processing invoices, purchase orders, expense reports, making payments and resolving queries. Auditing invoices and expense reports for approval. Processing the credit card statements and check runs. 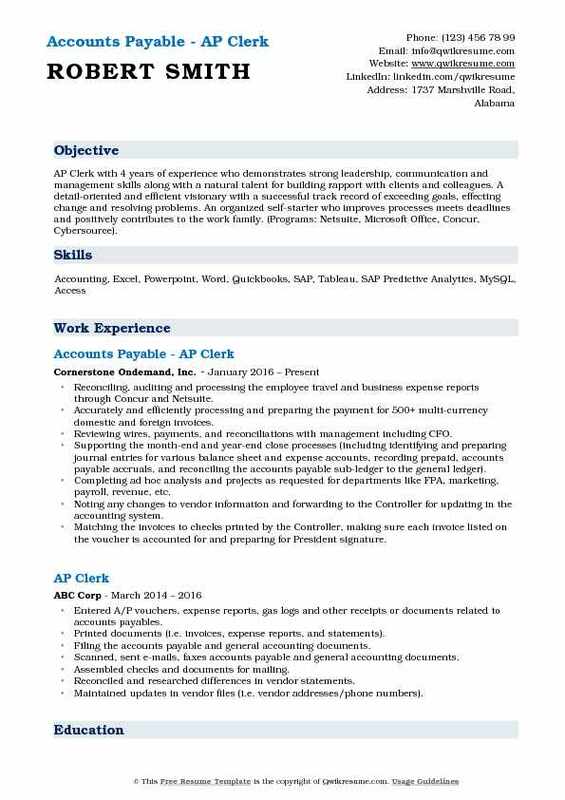 Summary : Determined AP Clerk I with 12 years of expeirnece with strong technical proficiency and commitment to accuracy in financial data entry and financial record keeping. 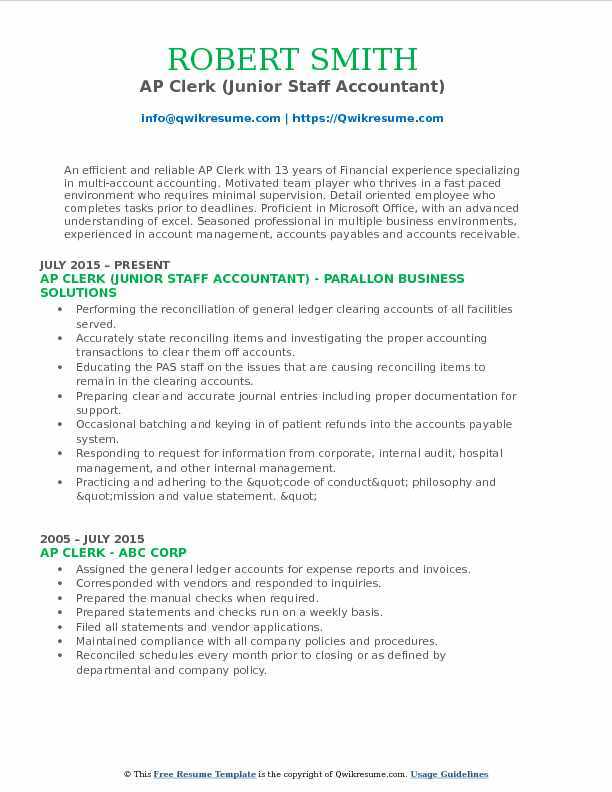 Desires an accounting position in a general office setting with an organization offering training and advancement opportunities to contribute my accounting, administrative, and managerial experience. Reviewing and verifying the invoices and checking requests, sorting, coding, and matching the invoices. Preparing and processing the electronic transfers and payments post transactions to journals, ledgers and other records. Reconciling the accounts payable transactions, monitoring the accounts to ensure payments are up to date. Researching and resolving the invoice discrepancies and issues corresponding with vendors and respond to inquiries. Assisting with the month end closing and providing the supporting documentation for audits. Providing account information resolution for current and new students handled check runs and check requests. Administering checks, EFT (electronic funds transfer), and ACH payments. Serving as a point of contact for vendors. Handling the corporate credit card reports, travel expense reports, and tax documents (1099s/W9). Handling the invoice batches into A/P accounting software. Objective : Self-motivated and outgoing Junior AP Clerk with three years of full-service accounting experience and a strong operational understanding that enables a calm balanced approach to fast-paced environments by remaining creatively adaptable. Sorted, coded, and batched AP for Accounting Manager review and prepared approved AP for signatures. Ensured timely remittance to vendors, including recurring vendor tracking and personal follow up. Managed master vendor files, tracked W9 status, and created online account profiles. Reconciled credit card expenses monthly and prepared estimated sales tax payments. Consolidated and reduced technology equipment and service billing via collaboration with the IT department. Spearheaded incoming and outgoing unclaimed property materials for the state of CA and prior FY independent audit materials. Reorganized pre-show and on-site cash handling preparations for increased effectiveness and speed. Trained the incoming AP clerk on office policies, procedures, and equipment. Objective : Exceptionally skilled and meticulous AP Clerk with 3 years of expeirnece and with an excellent record of strong accuracy and customer service. Adept at handling multiple projects well and completely under high-pressure deadlines. 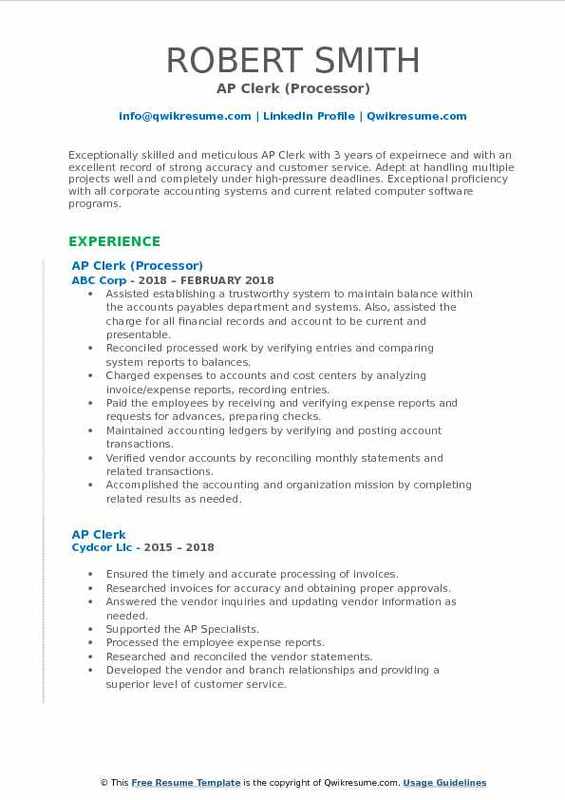 Exceptional proficiency with all corporate accounting systems and current related computer software programs. Assisted establishing a trustworthy system to maintain balance within the accounts payables department and systems. Also, assisted the charge for all financial records and account to be current and presentable. Charged expenses to accounts and cost centers by analyzing invoice/expense reports, recording entries. Paid the employees by receiving and verifying expense reports and requests for advances, preparing checks. Accomplished the accounting and organization mission by completing related results as needed. Summary : A versatile AP Clerk II with the proven competence of 15 years of expeirnece in managing multiple priorities in a fast-paced atmosphere while paying close attention to detail. I am capable of quickly establishing rapport by utilizing excellent leadership. Demonstrates the ability to perform effectively despite sudden deadlines and changing priorities. Expert proficiency in Microsoft Excel, Word, and PowerPoint, Adobe Acrobat, ADP Open Invoice, QuickBooks, and Enertia. Receiving all invoices and ensuring the proper approval before processing for payment. Accurately charging the expenses to specific accounts and cost center by analyzing invoices/expense reports. Resolviong purchase orders, contract, invoice, or payment discrepancies and documentation. Ensuring credit is received for outstanding memos, issue stop-payments and monitoring all checks going out. Responsible for monthly reconciliation of company and individual credit cards. Budgeting the weekly expenses with collaboration from the Accounting Controller and CFO. Assisting the accounts receivable with posting payments and running credit cards. Auditing and reconciling the corporate credit card transactions and statements. Researching quarterly variances (flux analysis) for all accounts payable accounts. Objective : AP Clerk with 4 years of experience who demonstrates strong leadership, communication and management skills along with a natural talent for building rapport with clients and colleagues. A detail-oriented and efficient visionary with a successful track record of exceeding goals, effecting change and resolving problems. An organized self-starter who improves processes meets deadlines and positively contributes to the work family. (Programs: Netsuite, Microsoft Office, Concur, Cybersource). Reconciling, auditing and processing the employee travel and business expense reports through Concur and Netsuite. Accurately and efficiently processing and preparing the payment for 500+ multi-currency domestic and foreign invoices. Reviewing wires, payments, and reconciliations with management including CFO. Supporting the month-end and year-end close processes (including identifying and preparing journal entries for various balance sheet and expense accounts, recording prepaid, accounts payable accruals, and reconciling the accounts payable sub-ledger to the general ledger). Completing ad hoc analysis and projects as requested for departments like FPA, marketing, payroll, revenue, etc. Noting any changes to vendor information and forwarding to the Controller for updating in the accounting system. Matching the invoices to checks printed by the Controller, making sure each invoice listed on the voucher is accounted for and preparing for President signature. Filing unpaid and paid vouchers as appropriate and maintaining a filing system. 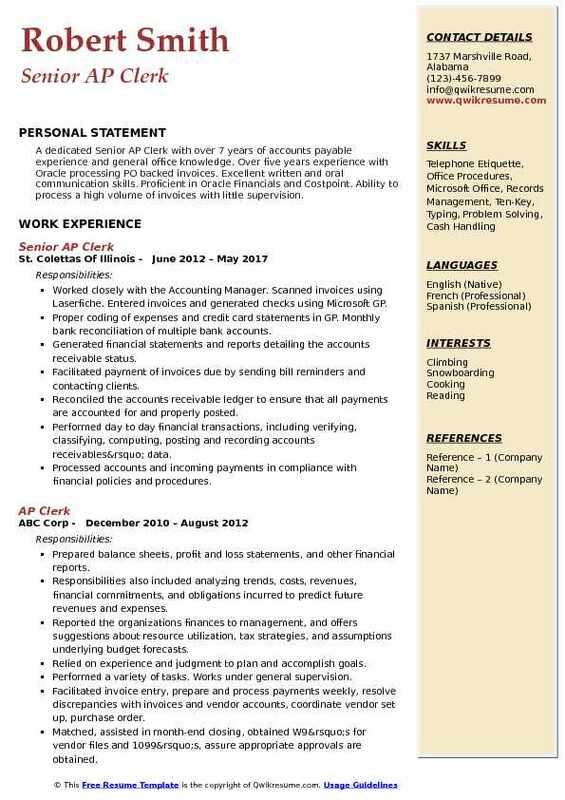 Summary : An efficient and reliable AP Clerk with 13 years of Financial experience specializing in multi-account accounting. Motivated team player who thrives in a fast paced environment who requires minimal supervision. Detail oriented employee who completes tasks prior to deadlines. 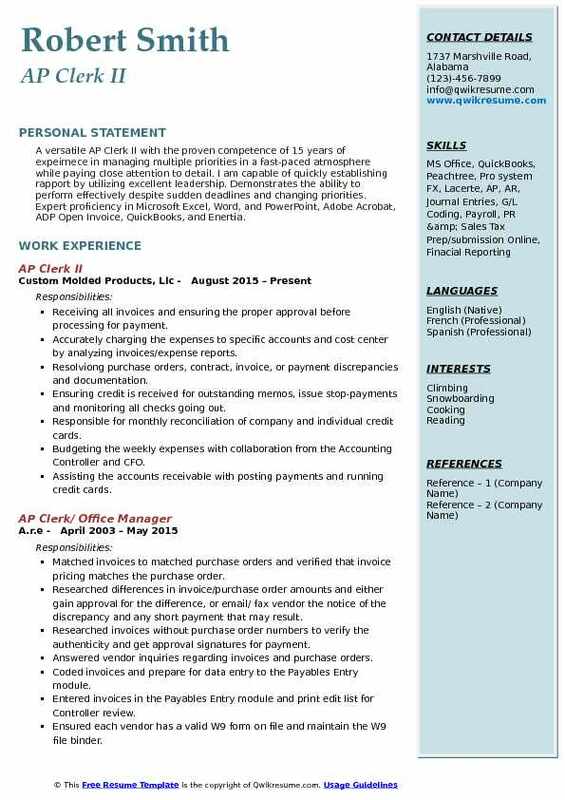 Proficient in Microsoft Office, with an advanced understanding of excel. Seasoned professional in multiple business environments, experienced in account management, accounts payables and accounts receivable. Performing the reconciliation of general ledger clearing accounts of all facilities served. Accurately state reconciling items and investigating the proper accounting transactions to clear them off accounts. Educating the PAS staff on the issues that are causing reconciling items to remain in the clearing accounts. Preparing clear and accurate journal entries including proper documentation for support. Occasional batching and keying in of patient refunds into the accounts payable system. Responding to request for information from corporate, internal audit, hospital management, and other internal management. Practicing and adhering to the "code of conduct" philosophy and "mission and value statement. " Compiling, prioritizing, and sorting, and processing the customer orders into the local database. Adjusting settings for the format, page layout, line spacing, and other style requirements. 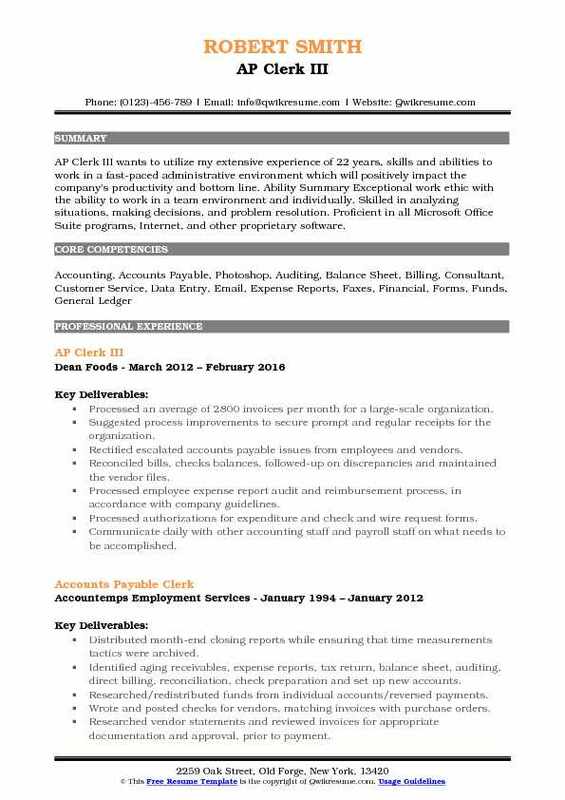 Summary : AP Clerk III wants to utilize my extensive experience of 22 years, skills and abilities to work in a fast-paced administrative environment which will positively impact the company's productivity and bottom line. Ability Summary Exceptional work ethic with the ability to work in a team environment and individually. Skilled in analyzing situations, making decisions, and problem resolution. Proficient in all Microsoft Office Suite programs, Internet, and other proprietary software. Processed an average of 2800 invoices per month for a large-scale organization. Reconciled bills, checks balances, followed-up on discrepancies and maintained the vendor files. Processed employee expense report audit and reimbursement process, in accordance with company guidelines. Processed authorizations for expenditure and check and wire request forms. Communicate daily with other accounting staff and payroll staff on what needs to be accomplished. Responsible for uploading invoices into oracle r12 and ensuring that necessary approval thresholds. 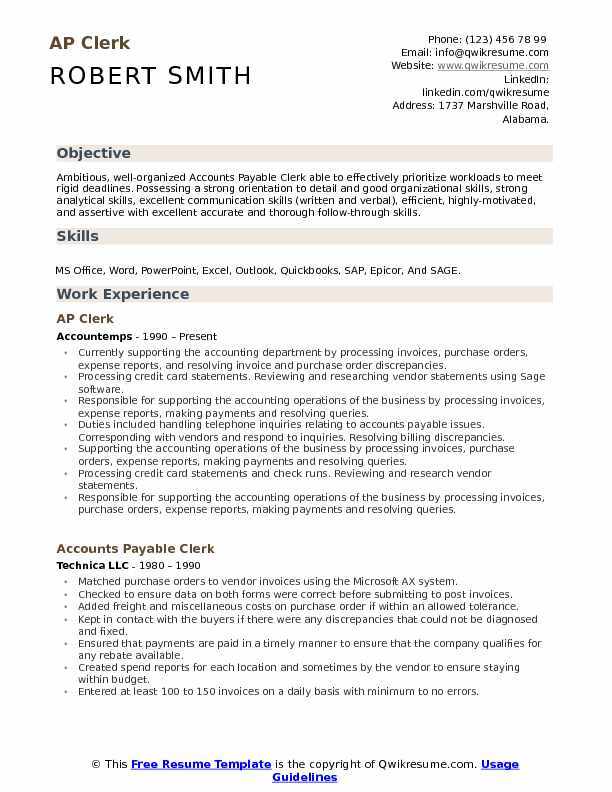 Summary : A dedicated Senior AP Clerk with over 7 years of accounts payable experience and general office knowledge. Over five years experience with Oracle processing PO backed invoices. Excellent written and oral communication skills. Proficient in Oracle Financials and Costpoint. Ability to process a high volume of invoices with little supervision. Worked closely with the Accounting Manager. Scanned invoices using Laserfiche. Entered invoices and generated checks using Microsoft GP. Proper coding of expenses and credit card statements in GP. Monthly bank reconciliation of multiple bank accounts. Generated financial statements and reports detailing the accounts receivable status. Facilitated payment of invoices due by sending bill reminders and contacting clients. Reconciled the accounts receivable ledger to ensure that all payments are accounted for and properly posted. Performed day to day financial transactions, including verifying, classifying, computing, posting and recording accounts receivables’ data. Assisted A/P with running checks to pay vendors and doctors. Matched invoices with checks for approval. Attached invoices to receiving reports, backup documents prepare cover sheets. Entered into the system for payment. 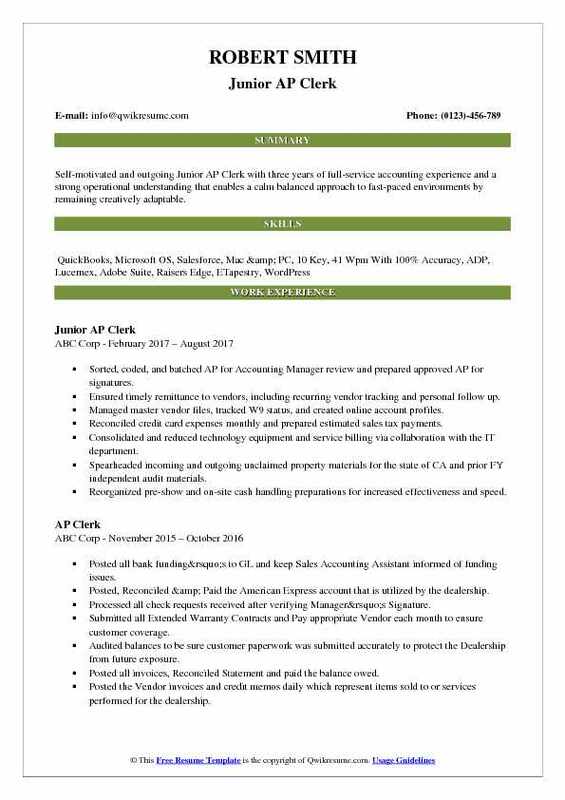 Summary : Reliable and results-oriented, AP Clerk experienced in providing financial, administrative and clerical services. 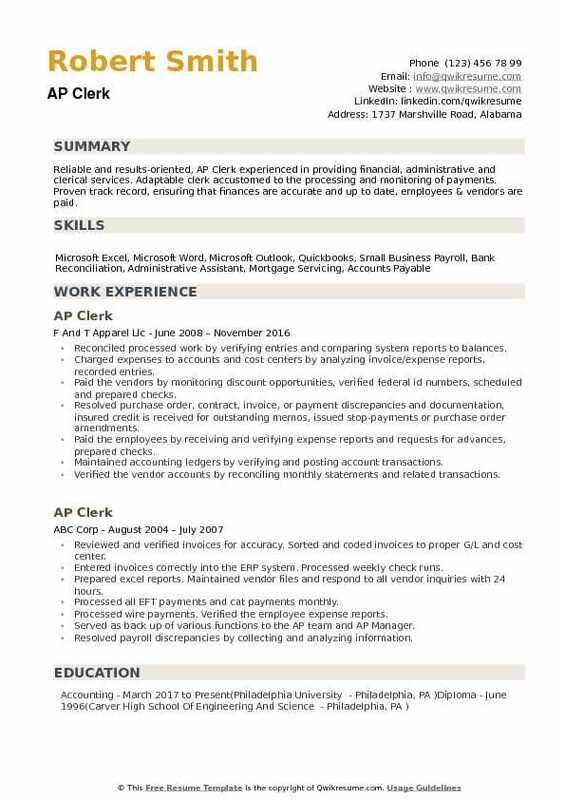 Adaptable clerk accustomed to the processing and monitoring of payments. Proven track record, ensuring that finances are accurate and up to date, employees & vendors are paid. Charged expenses to accounts and cost centers by analyzing invoice/expense reports, recorded entries. Paid the vendors by monitoring discount opportunities, verified federal id numbers, scheduled and prepared checks. Resolved purchase order, contract, invoice, or payment discrepancies and documentation, insured credit is received for outstanding memos, issued stop-payments or purchase order amendments. Paid the employees by receiving and verifying expense reports and requests for advances, prepared checks. Verified the vendor accounts by reconciling monthly statements and related transactions. Maintained employee confidence and protects payroll confidence by keeping information confidential.